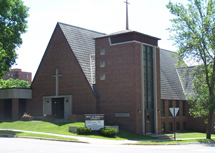 Welcome to the Zion Lutheran Church website. We hope this site will help you learn more about us and our witness for Christ. Zion has a long tradition of outreach and service to its members and the community. We are here for you. "As the grains of wheat...Zion grows and serves"
We hope you will join us for service on Sunday to experience for yourself the fellowship of Christ. What's been going on at Zion? Get a glimpse of some of the many activities that take place at Zion.